Choosing a coffin is difficult for grieving families and many of our families do not wish to dwell on the range available. We understand this and we will ensure that the coffin provided is practical, affordable and a fitting resting place for your loved one. We will always provide you with the most practical and affordable option to suit your needs. Many of our families choose the Whitworth Coffin which is an elm veneered coffin with 3 pairs of brassed handles, artificial silk linings and engraved nameplate. The cross is optional for religious or non religious ceremonies. 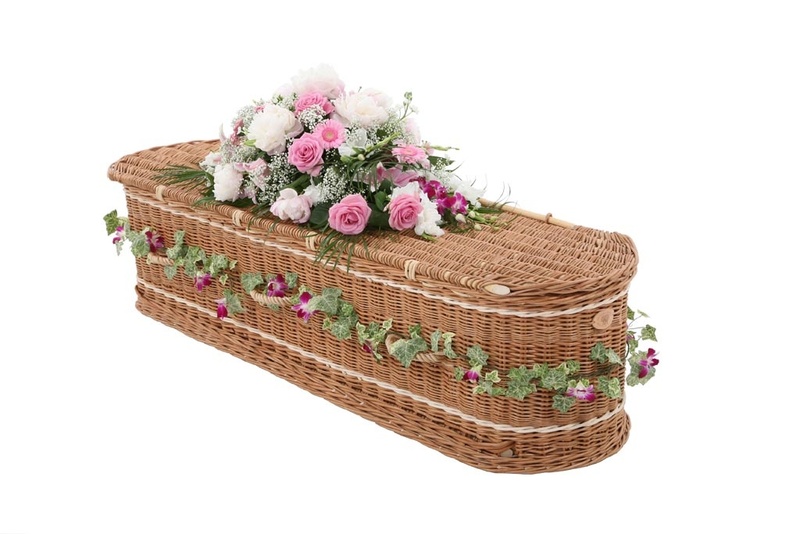 We do have many other options available, Somerset Willow, wicker or cardboard for families planning an eco friendly funeral, or beautifully decorated colourful coffins and solid wood caskets for a really personal tribute. We are happy for you to leave personal items in the coffin whilst in our care. The crematorium do have health and safety restrictions on certain items left in the coffin and our staff will be able to advise you on the current regulations(For a burial there are less restrictions). If you have chosen a cremation the ashes will be returned to us in a bio-degradable box. If you would like to scatter your loved one’s ashes please let us know after the funeral and we will transfer the ashes into a polytainer (free of charge). Otherwise if the ashes are to be interred under the ground we are able to place them in a small wooden casket with nameplate.